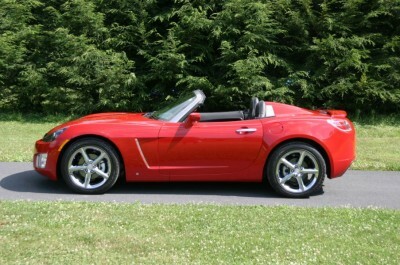 The Saturn Sky is a two-seat convertible combining power, a host of amenities and a stylish appearance for an affordable price. This light weight car carries a 173 hp 2.4 liter Ecotec four-cylinder engine mated to a 5 speed manual transmission. The low center of gravity and 18″ alloy wheels allow you to hit the sharpest turns with hardly touching your breaks. This Sky has a gorgeous red paint job with black leather interior, all looking like new! This car is a blast to drive!